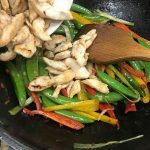 Stir fries are quick and easy to make. Once you have all the ingredients prepared they take just minutes to cook. 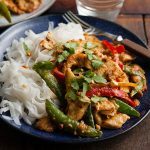 This Nutty Chicken Stir Fry is no exception making it an ideal midweek meal when you need to get something tasty and on the table quick. 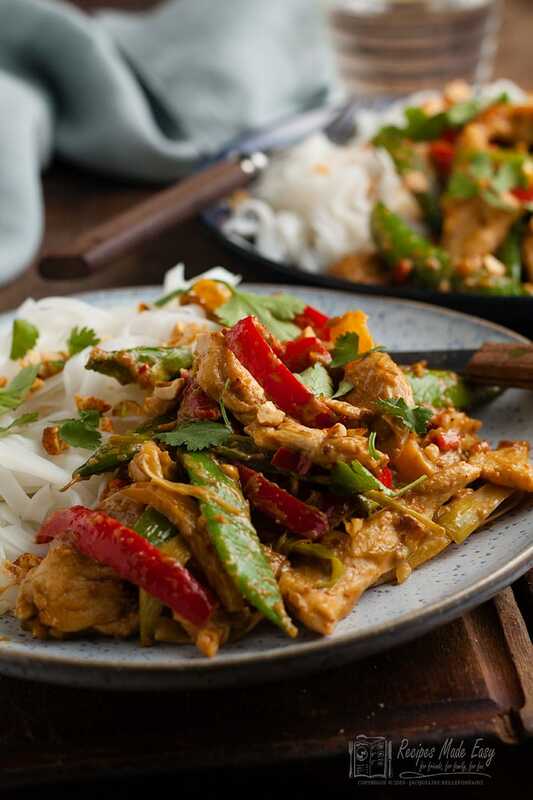 I don’t know about you but stir fries are one of the mainstays of our midweek meals. Quick and easy to prepare and cook they are also great for using up all the odds and sods left in the fridge. Which means I rarely make exactly the same stir fry twice. That said the sauces I make for them do not vary much. This one uses peanut butter to give a delicious thick creamy peanutty taste rather like a saté sauce. 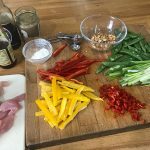 I use large red chillies which makes for a mild sauce but you can use smaller hotter chillies or add some of the seed if you want a bit more of a chilli kick to the dish. The key to successful stir fries is to prepare all the ingredients before you start. Actually that is a very sound tip when cooking any recipe that I don’t always follow myself and as a result, sometimes I get caught out midway through a recipe. 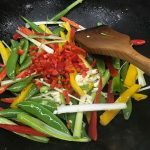 But it is really important when cooking stir fries, as once you start to cook everything happens pretty quickly and can easily spoil if you do not have all the ingredients ready to go. 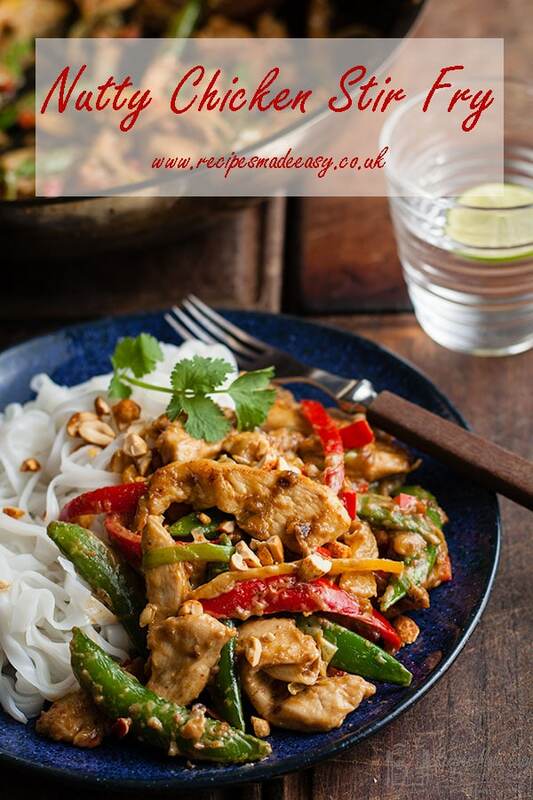 I usually serve this nutty stir fry with noodles, I have used rice noodles here but you could use regular egg noodles. It also goes well with rice. Check out my How to Cook Perfect Basmati Rice post if you find cooking rice a bit tricky. Garnish with some chopped peanuts for added crunch and some fresh coriander. 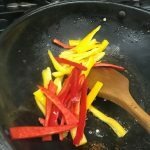 As I mentioned, stir fries are great for using up lefts over in the fridge, so if you don’t have a red and yellow pepper use whichever colour you have. I’ve used sugar snap peas because I prefer them to mangetout, but they would work too or you could add some asparagus or small broccoli florets instead. Sliced regular onions can replace the spring onions and you could chuck in some carrot is you have a spare. A quick and easy chicken stir fry with a thick creamy nutty sauce. Prepare all the ingredients. 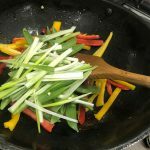 Heat 2 tsp of the sunflower or olive oil in a wok or large frying pan. Add the chicken, and fry stirring over a high heat until browned. Remove from the pan and set aside. Reduce the heat and add the remaining sunflower or olive oil. 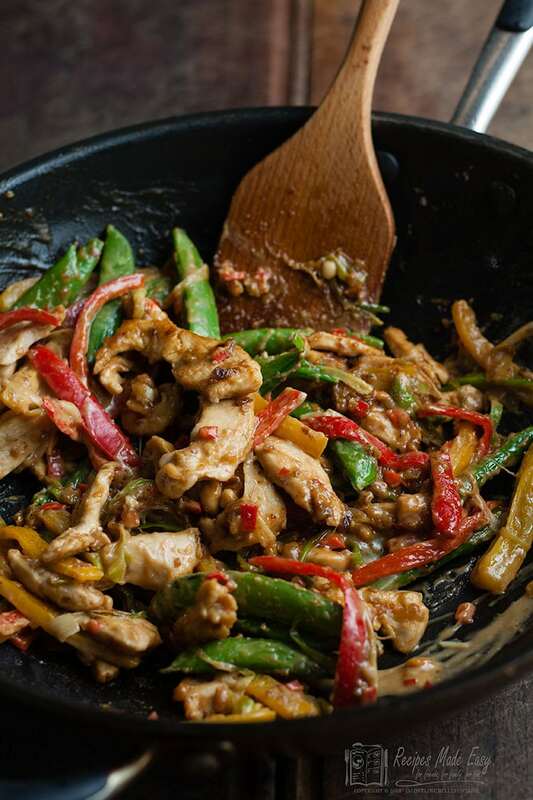 Add the peppers, sugar snap peas, spring onions garlic and chilli and stir fry for 3 to 4 minutes until softened. Return the chicken to the pan. Add the peanut butter and stock to the pan, and stir until well combined. Cook for a further 3 to 4 minutes or until the chicken is cooked through. Mix the cornflour with the soy sauce to form a smooth paste. Stir in the cornflour mixture into the pan along with the sesame oil. Cook stirring, until thickened. Serve with noodles or rice sprinkled with the roasted peanuts and garnish with coriander if desired. 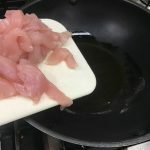 Fry the chicken until browned. remove from the pan. Followed by the sugar snap peas and spring onions. Stir to combine then add the garlic and chilli. stir fry until just tender. Add the peanut butter and stock cook for a few minutes then add the soy mixture and sesame oil. Stir well. Serve with noodles, sprinkled with chopped nuts and garnished with coriander if desired. I could eat a huge bowl of this right now! It looks absolutely delicious. Peanut butter is such an amazing ingredient. I made this for our family dinner and it was a huge thumbs up from everyone. My daughter has a severe peanut allergy however I simply substituted with cashew nuts and cashew nut butter. 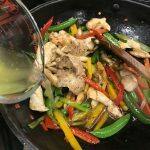 Great tasting recipe and super quick to prepare. Fabulous I’m so glad they all enjoyed it. I must try cashew nut butter myself. Hi Jacqui. This looks delicious. I’m like you in that I love to cook quick a stir fry mid-week. Along with soup I find them the best way to get vegetables into my children. And my eldest loves noodles so this would go down very well! 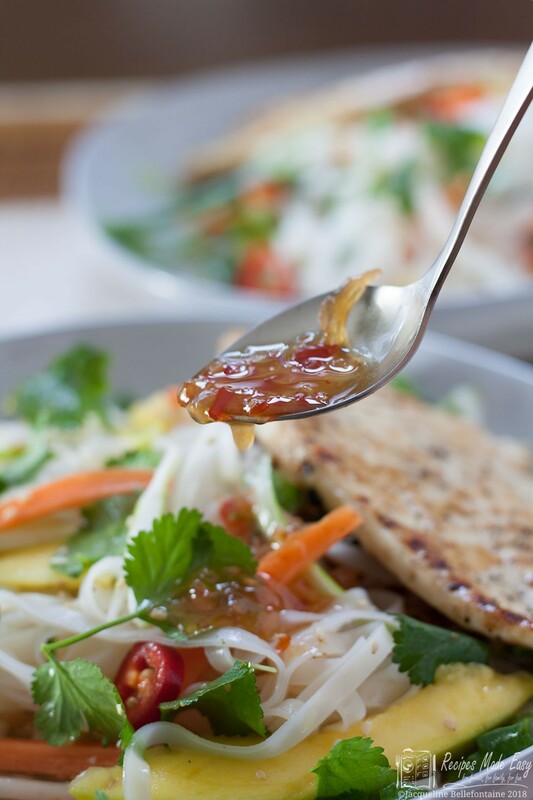 I’m sat reading this recipe wishing I had the ingredients to make this for dinner tonight! I’m definitely making this for dinner this week. I love a quick and tasty mid-week recipe.